No worries. Will test as soon as I get the new version. 1.0.14 is still the latest version showing in the Brasil repo as of this morning. I haven't seen version 1.0.15 yet so guessing you are still working on it. I am still seeing this problem with current version 1.0.14. Thanks! As mentioned - usage of RT/MC rating values within "DialogVideoInfo.xml" works very well ($INFO[Window(Home).Property(SkinHelper.ListItem.rottentomatoes.meter)] etc. ), but said rating values seem to be only set when opening "DialogVideoInfo.xml" from within the typical KODI movie library. With the version before 1.1.3 this was not the case. The ratings were set and usable the same as they are when opening "DialogVideoInfo.xml" from within the typical KODI movie library. Also SkinHelper.ListItem.Year does not show the first and last years, it only shows the first one. On the wiki it says it provides first year with a dash then the last year (using "Years" works to show every year but there is no property that shows the range of years which would be far more useful than just showing first year). (2017-03-17, 06:58)jurialmunkey Wrote: [ -> ] Also SkinHelper.ListItem.Year does not show the first and last years, it only shows the first one. On the wiki it says it provides first year with a dash then the last year (using "Years" works to show every year but there is no property that shows the range of years which would be far more useful than just showing first year). Ah yep you are right. Just realised I only had the repo installed on my windows partition and not my fedora one. The problem with Title/Label is still there however. Though it only needs a wiki change really. How do you get static fanart behind your channels? I've got a m3u linked with Simple Client IPTV and set a epg. But I want set static fanart behind the channels. Not related to a epg but only related to a channel. I have only four sports channels and want to configure fanart urls form internet. Or maybe I must set my m3u or another setting. I have the latest Kodi RC on Windows 10 with the skin Arctic Zephyr. I no longer see my TV channels in the first or second widget. I only see my recent recordings now. work on streams also? It doesn't work for me. Those code working for Movies-Stream...With episodes have problem. I use WebService but Marcel need to add this code from Isue github..missing some art for webservice. Marcel I know its hard to see all isue when we write, but where to write? here ..or in github "Isue" ? Still unable to do Restore using skin helper skinbackup service. Created a debug log using just the default Krypton Estuary skin and using local storage for backup and restore (took out the NAS to simplify debugging). Did a backup (complete no errors and file looks complete) and a restore of the backup file just created. The restore fails in the same way as previous. I will PM the link to the complete debug log. @marcelveldt - I was wondering if you would consider implementing an option that allows users to select whether info should be preferred from the database or the web scraper. This was specifically in request to the imdb top 250 -- I have a user who regularly keeps their ratings info updated, so the info in their database is more up to date than the info pulled from omdb. I think this would be a sensible option because it would allow more control to those users who like to closely manage their db info whilst also reducing unnecessary double up of web traffic load. 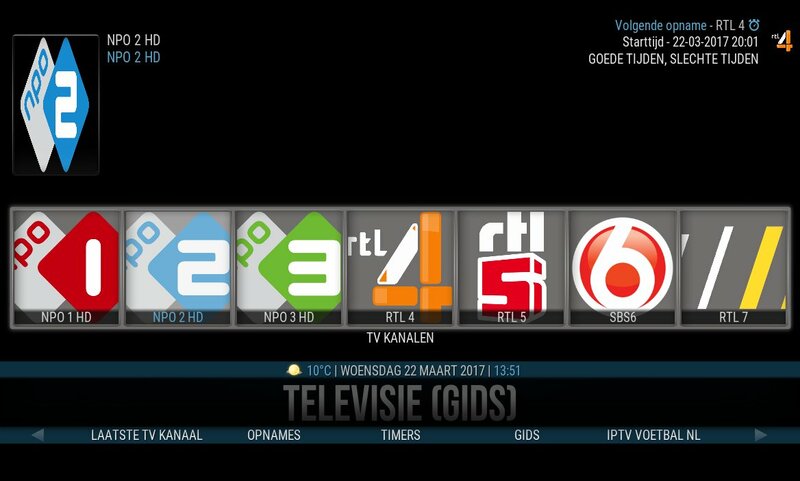 (2017-03-18, 17:26)heula Wrote: [ -> ] I no longer see my TV channels in the first or second widget. I only see my recent recordings now. I got my TV Channels as a widget working now but with the skin helper service widgets in addons videolibrary. The TV channels from the LIVE TV widgets don't work. Issue is the logo size in the poster square widgets. The do not fit. I tried to make my logos smaller but it does't help. How can I get the channel logo's fit? I have disabled fanart for PVR because I just want to see the channel logo but there is no background image. Any way to set a background per channel or one standrd background for all?